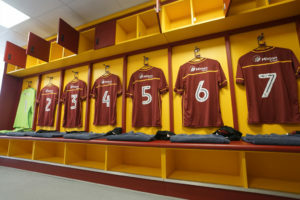 The team from Mitton Group has completed comprehensive alterations and upgrade works to the dressing rooms at Bradford City’s Northern Commercials Valley Parade Stadium employing full BIM services and processes. These updates reflect the changes required by the Football League’s Dressing Room Criteria first issued in 2014. 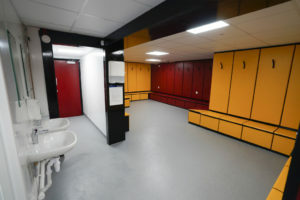 With the criteria officially already in place to ensure established standards for changing room facilities at football grounds, the management team at Valley Parade was tasked not just with upgrading provision at the stadium but also with sourcing funding for the necessary changes. It was resolved to run a ‘crowd funding campaign to finance both the changing room project and to install a new large screen/scoreboard at the ground, which was managed in partnership with Tifosy, the crowdfunding specialists, who use their skills to give fans the opportunity to influence the growth of their clubs and to support them financially. With Tifosy’s help and the commitment of the Bradford City fans, The Bantams’ highly successful ‘Upgrade the Parade’ crowd funding campaign raised enough funds for both projects to go ahead. The dressing rooms in question had been in much need of renovation for some time and would have failed to meet Football League standards for 2016/17 season. The campaign has meant the club could achieve a professional renovation project without eating into other budgets. The criteria stated that both Home and Away dressing rooms should have a clear changing area of at least 30m2 and that each changing room should include a specified number of showers/baths, toilets, urinals and hand basins. Whilst the Home changing rooms at Valley Parade were spacious enough to meet this challenge, the Mitton team needed to make some significant changes to the fabric of the building to match the requirements for the Away facilities and the Officials space. The outline plan was to extend the Away changing room into the current shower area and also to knock through into the existing shared toilet facilities. These toilet facilities were then to be made available for the sole use of the visiting team. The existing Home shower area would also be knocked through to form part of the Away space. 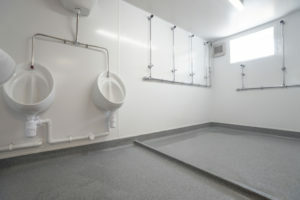 A new shower and toilet area was then to be constructed within the existing large Home changing room for the sole use of the Away team. At the same time, the Officials changing room was to be extended by knocking into the Home changing room adjacent to house a new shower/toilet area, allowing the existing space to be used for changing only. The end result was Home & Away areas would be swapped over. Working within the restraints of a very tight programme schedule, sandwiched between the previous season and the new season, as well as the issues presented by working with an aged building and services, the Mitton team began by stripping out the old changing room area completely. Walls were taken down and the necessary structural steel supports installed to enable total reconfiguration of the footprint. Attention was then turned to the underground drainage, which required significant excavations in a very tight space, most of which had to be dug by hand rather than by mechanical digger due to the space constraints. New walls were installed and wall finishes completed, including new ceilings with downlighting, practical resin flooring and hygienic walling systems. All new sanitaryware was installed, including toilets, baths, showers and wash hand basins. In the Home changing rooms, the new cubicle benches in Bradford City colours, which had been manufactured off site, were brought in and bolted into place. 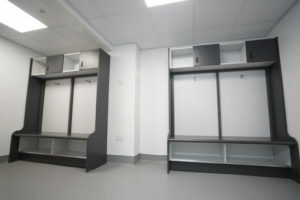 The finished project included revamped Home and Away changing rooms to a specification approved by the EFL, as well as the Officials changing room. Additional design changes incorporated along with way included the design and fit out of a new Management room, as well as the demolition of outhousing, all completed on time and to budget by the Mitton team. In total, the project was completed in just seven weeks from initial demolition work through to fit out and handover. This was the first job handled by the Mitton Group to be managed totally according to the BIM (Building Information Modelling) process, using digital 3D modelling of the asset to optimise the result. This level of information modelling and information management creates value from the combined efforts of people, process and technology, bringing together all the information about every component of a building, in one place. Using BIM, any risk of errors or discrepancies is reduced, and costs are minimised. BIM services are seen as the future of design and long term facility management. The Mitton Group has committed to the concept, encouraging personnel training and investing in equipment and software to optimise the potential. James Mason, Bradford City’s Chief Operating Officer, talks about the role played by Mitton in the drive to ‘Upgrade the Parade’.